I would imagine this is on the horizon...thoughts anyone? They better! It’s about damn time they come out with a new Scorpio. The old one was announced a whole week ago! Talk about old news. But in all seriousness that seems awesome. I imagine a "Scorpio Mini" must happen, as I kinda see the Scorpio as a "688 mk2" (well, it is also a "788T mk2" as well for some people). Thus it is only logical that something which is a "633 mk2" comes along, that brings some of the advancements of the newer Scorpio generation but in a smaller and more scaled back packed. As the 633 must be Sound Devices' best selling recorder ever (well, until the MixPre series came along!). +1 but please don't ask Santa for a "633 mk2" or you will get a Scorpio with just 3 preamps / 3 faders... where SD got this 3 thing from I don't know. 4 XLR mic ins is the magic number here - so much more useful. 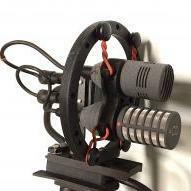 For ambisonics though having 4 is the "magic number", but I'd be fine with having a "633 mk2" as my main machine and pulling out a Zoom F8n on the rare occasion I'm recording ambisonics. I agree with the need for 4 Mic inputs, even for TV or documentary jobs. I often add a double preamp to the 633 when shooting for a cultural TV show. Recording a small band live, or a theatre play for a short extract on TV doesn't justify a full kit, especially with the time constrains we face. But an MS boom and two more mikes makes the perfect kit for this kind of job. Sound Devices was impressive in pushing out heaps of MixPre recorders quickly. But if we ignore the M variants, as they're just "small" differences, then they had three: 3 / 6 / 10T. The last of them was the MixPre10T, which has a roughly year and half gap between the 10T shipping and when Scorpio will ship. Thus if we figure out a similar product development cycle for the next big release then this will come in late 2020, which is roughly a year and half from now.